FACT CHECK: Was a Russian Nuclear Executive Killed in a Plane Crash to Cover Up Clinton Corruption? Conspiracy theorists falsely linked a deadly Moscow plane crash to Uranium One, a debunked Hillary Clinton "scandal." 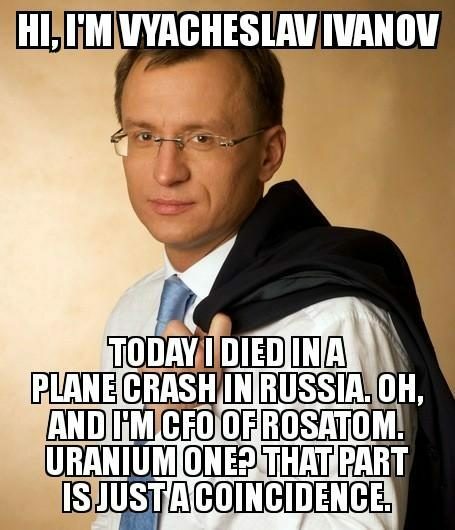 Vyacheslav Ivanov, a former executive at Rosatom, was killed in a February 2018 plane crash as part of a "deep state" plot to cover up corruption by the Clintons. In February 2018, just after a deadly plane crash in Russia, conspiracy theorists seized on a name among the rosters of those killed to claim that one of them was an executive at Russia’s nuclear agency Rosatom; they further speculated that the incident was a CIA operation designed to silence individuals who could provide information that might be damaging to 2016 presidential candidate Hillary Clinton. Hi, I’m Vyacheslav Ivanov. Today I died in a plane crash in Russia. Oh, and I’m CFO of Rosatom. Uranium One? That part is just a coincidence. The suspicions are that it may have been a U.S. intelligence agency CIA hit, to kill these Rosatom executives to prevent them from testifying or being available to give testimony in the beginning enquiries on the whole Uranium One scandal, which I’m predicting will be the end of Robert Mueller’s career. Corsi did not name any executives other than Ivanov. The “Deep State” now seems [to be] scrambling to remove any “loose ends” who might testify against the Clintons. The man shown in the meme is Vyacheslav Ivanov, who was chief financial officer of Rosatom until May 2017, according to his LinkedIn profile. There was also someone named Vyacheslav Ivanov killed on Flight 6W703, according to a list of names published by Russia’s Ministry for Civil Defense, Emergencies, and Elimination of Consequences of Natural Disasters. However, they are not the same person. Firstly, the man killed on Flight 6W703 (Passenger #32) was born in 1986. In 1987, Rosatom’s former chief financial officer Vyacheslav Ivanov began studying for a degree in Computers and Networks at the Moscow Institute of Radioelectronics, according to his LinkedIn profile; either the #QAnon crowd either missed this detail, did some extremely creative math and hoped no one would notice, or Ivanov is a genius the likes of which the world has never seen. Unfortunately, the “genius” theory doesn’t hold water, either. The former Rosatom CFO posted photographs of himself to Facebook on 12 February 2018, a day after the crash of Flight 6W703. The false Ivanov conspiracy theory was not the only one that spread online in the aftermath of the crash. Buzzfeed documented right-wing and conspiracy theorist web sites that claimed, also falsely, that Sergei Millian, a Belarussian-American businessman reported to be a source for the dossier at the heart of Special Counsel Robert Mueller’s investigation into possible collusion between Russia and the Trump campaign in the months leading up to the 2016 election, was also among the dead. Russian authorities have not listed anyone by the name Sergei Millian as a passenger of Flight 6W703, and there is no evidence to support claims that Millian uses the alias “Sergei Panchenko” — a name that actually does appear on the official list of passengers. The Guardian. 11 February 2018. Washington Post. 29 March 2017.